One of Peter's favorite Christmas presents was Moon Sand. 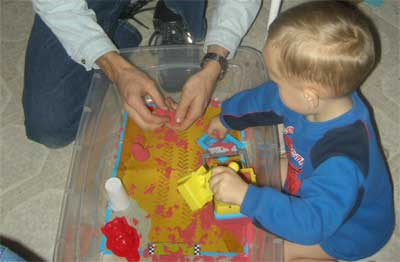 Sand exploration is especially good for toddlers because, in addition to the sensory and creativity experience, it helps them develop finger dexterity. I loved the idea in a Montessori-related book, I Can Do It! I Can Do It! of putting sand in a large container like a cat-litter box, or in our case, a large Tupperware. This makes clean-up a breeze, because I just put the lid on it and we're done. The moon sand is a fun product because it is mold-able, isn't sticky, and won't dry out, but really any sand would be just fine. I have seen play sand at the hardware store too. To make it mold-able, just spray it with water until you get the consistency that you want, and let them have at it. Things like muffin tins, ice cube trays, and plastic dishes can be added to the collection. Dry sand has its own possibilities, as it can be sifted and poured. Dry sand is also fun to draw in with fingers.